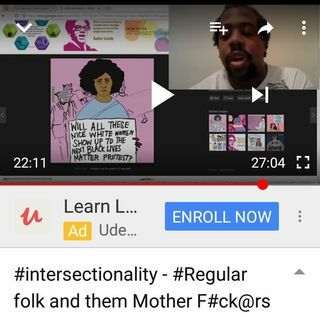 @DanTresOmi & @samscorner2018 & @GrandpaCrunk & talk Kimberlé Crenshaw's (@Sandlylocks) concept of intersectionality politics on the #FlyGuysPodcast using the ZOOM platform. Stay tuned for deep conversation and Sam's comical-conscious-crazy talk. Kimberlé ... Más informaciones Williams Crenshaw (@sandylocks) is an American civil rights advocate and a leading scholar of critical race theory. She is a full-time professor at the UCLA School of Law and Columbia Law School, where she specializes in race and gender issues. "In recent times, intersectionality theory – the study of how different power structures interact in the lives of minorities, specifically black women, a theory she named in the 1980s – has enjoyed a resurgence in popular and academic feminism. Her name and her work has become an introductory point for feminists of all stripes."